CRT has three calorimeters for refrigeration machinery capacity testing. These calorimeters or combinations can be used for testing vehicle refrigeration units, multi-compartment vehicle refrigeration units, beer cellar coolers, heat pumps etc. 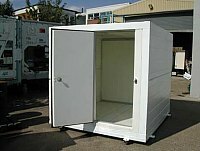 In most cases, the refrigeration unit is bolted on to an insulated framework designed to fit into the orifice of the appropriate calorimeter. For split units pipes are connected between the internal and external units. A controllable heater is placed within the calorimeter along with a circulation fan and temperature measurement sensors. 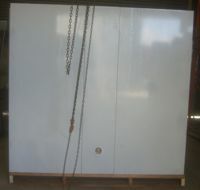 The calorimeter and refrigeration unit is then placed in an environmental test chamber. 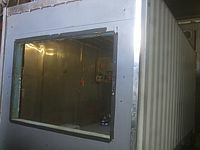 The calorimeter and refrigeration unit are then thermally calibrated by cooling the environmental chamber and heating the interior in accordance with any necessary requirements. The refrigeration capacity is taken as the sum of heat passing through the structure of the calorimeter and the electrical energy consumed by the balancing heaters and fans. 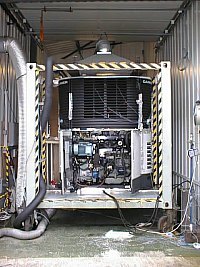 The calorimeters can also be used for compliance testing for ATP (Agreement Transports Périssables) refrigeration capacity for Transport Vehicle Refrigeration machinery manufacturers.